Car servicing is one of the one most important aspects for any vehicle. There are different things that must be recalled while providing your car for servicing and repair. A professional care for your car can provide much better performance and can increase the life period of the car. People around Delhi and Gurgaon who own a Maruti car can get a range of benefits in addition to a regular car service and the car can deliver higher performance and better mileage. Qutab auto Pvt ltd. in Gurgaon are professionals in car care and are Maruti authorized service provider. Our high end services have gained a huge appreciation among our customers and we make the best efforts to leave customers happy and satisfied. We can make the best possible results for your vehicle and can make the process much easier for you. Qutab Auto Pvt ltd. was founded in Gurgaon in 2002 and has been providing customers with a wide range of benefits for their automobiles. Leading the road map with appreciation and applause we opened two other Maruti authorized service stations in Sector 9 and Cyber Park. Our garage is composed of experts who know their stuff well. The services covered by us for your vehicle are technical to meet the requirements of different customers. Additionally to car service plans your vehicle also gets covered under insurance provided by us. With all inclusive features offered by our service plans we are the leading auto service provider in Gurgaon region. Suppose you get stuck in the middle of nowhere and help isn't reachable for miles. Such situations are often due to vehicle breakdown. Being a Maruti Authorized service station in Gurgaon we are there where no one else is. If your car has stopped nearby Gurgaon Region then you just need to get in touch with us and we'll reach you in no time. Our emergency service kits come with the latest service equipments and are designed to quickly make fixes for different issues with a car. With the most professional technicians and tools your car is assured to cover another few miles to the service station for further inspection. 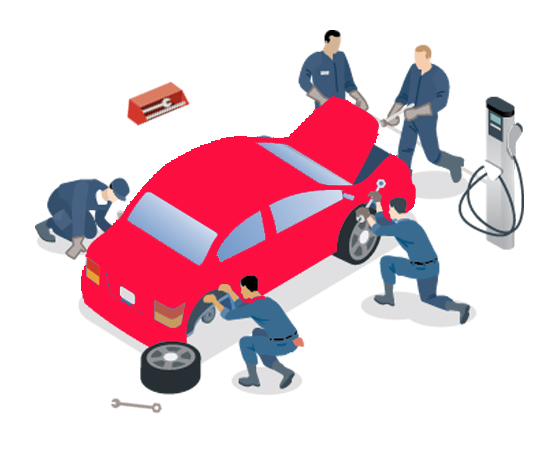 Whether you've got accidental damage, need car servicing or need to make minor repairs, you get all these services from Qutab Auto Pvt Ltd at reasonable costs. With an authorized Maruti service station you get much beyond the usual service. As a part of our process we ensure a firm inspection so that all the errors get covered and fixed at the very first attempt. We know that everyone hates to visit the same place again and again for the same problems. So itâ€™s better to get the tasks fixed without making the process problematic. You need a service for your Maruti car but canâ€™t spare some time to reach the service center. In such situation your care wonâ€™t be affected as our professional technician reach your doorstep to service and repair your car within your home garage. The service is one of its own kinds. Get in touch with our support professionals and we will be there within a short matter of time. Our customers appreciate our efforts and provide us with positive feedback. In case your car needs a service or repair then you can consider the services of expert technicians of Qutab Auto Pvt ltd car service center in Gurgaon. The car care experts make sure that all the needs for your car are met without putting you into hassle.